Kids Tipis can be used for outdoor or indoor use. 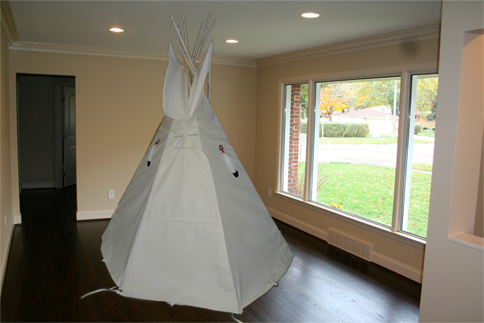 The tipi is 6 1/2 feet wide and fits in a room that has 8 foot ceilings. Our kid's tipi is a miniature version of our larger ones. Although the kids Tipi does not set up like the larger ones. 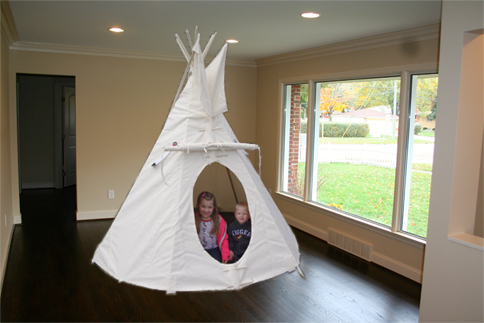 It is the most authentic Sioux Style kid's tipi on the market. Our lacing pin strip is triple thick, all stress points are re-enforced, bottom of tipi is hemmed with 3/4" cotton webbing and all edges are finished which prevents fraying. All seams are a flat felled locking seam. The 6 1/2 ft model comes with 2 beaded rosettes sewn on the tipi and 2 imitation eagle feathers. The 2 beaded rosettes and eagle feathers are not standard on the 8 ft model. Standard on both models are wooden lacing pins, metal stakes for outdoor set up and Solid hardwood poles (No Splices). There are 6 poles tied together along with one lifting pole and two smoke flap poles. Re-enforced pockets with ties are sewn on the inside of the tipi for the poles to fit into for indoor setup. It also comes with a door flap with a sewn in stiffener stick that easily rolls up and out of the way and hooks on the lacing pin. Tipi comes in an easy to carry storage bag. No tools necessary for easy setup. Detailed setup instructions included. Canvas is durable for outdoor use. This is a very high quality 13 oz. canvas. It is the same canvas we use in making all our tents. It meets the California Fire Code CPAI-84, (fire retardant), is mildew resistant and repels water. It can be painted with water based latex paint to add color and help your child's imagination soar. It will give your children & grandchildren many years of fun. This tipi is built with the same high quality standards as with all of Red Hawk Trading's Tipis and tents. Our Sunforger is treated for all 3 problems.